When we launched the Striper Cup in 2006, our goal was to revive the competitive interclub tournaments of the 1960s and 1970s with a conservation-minded format that reflected the changed values of our fishing community. Over the past 13 years, we’ve adjusted the structure of the tournament every year, most often to reduce the number of fish weighed in for the tournament while increasing angler participation. We’re proud of what the Striper Cup has become. In 2018, we had our largest number of entrants and highest level of participation. Over 4,000 people entered over 113,900 inches of striped bass in our catch-and-release category, and we awarded dozens of pairs of Costa sunglasses, thousands of dollars in Shimano rods and reels, 20 YETI coolers and a Hobie kayak to fishermen who chose to release fish rather than weigh them in. The next step in the evolution of The Striper Cup is an obvious one. 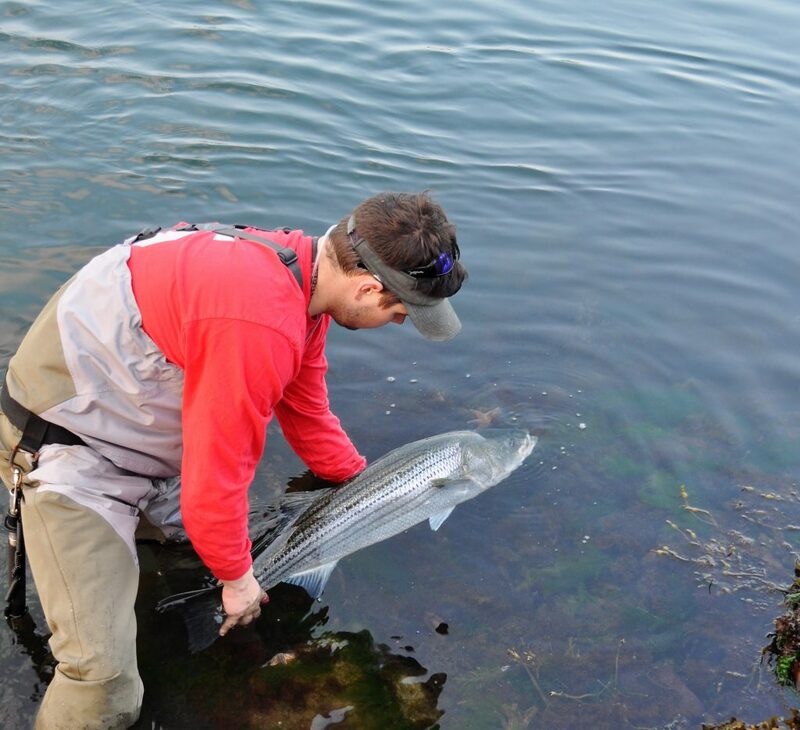 We want to encourage fishermen to release large striped bass, and so we are eliminating weigh-ins. There is not a single prize in the 2019 Striper Cup that requires an angler to keep a striped bass. Instead, with more prizes to give away than ever before, we are going to reward fishermen who submit photos of their catches rather than weigh slips. In some ways, today’s Striper Cup is barely recognizable when compared to what it was at its inception. In 2006, we described the Striper Cup as a season-long tournament, where the best of the best fiercely competed as individuals and teams to see who could catch the biggest striped bass. Today, the word tournament is hardly adequate to describe what the Striper Cup is—it’s a club itself, a season-long event (with a great party at the end), and a community that welcomes all types of anglers, no matter how or why they fish. The mission statement of the Striper Cup has always been “to celebrate fishing for the beloved striped bass.” That remains unchanged, and I think most striper fishermen would agree that there’s no better way to celebrate catching a big striper than to watch it swim away. On the Water should make stricter regulations for measuring the fish. There is no safeguards in place to stop someone calling a 40” striped bass a 42”, or calling a 48” a 50”. When you weigh a fish, its a certified scale, and there is no dispute as to exactly what the fish weighs at the time you bring it to a weigh station. You should be requiring photos of the fish taped. In my opinion, video would be better, but it would take forever for you guys to go through each entry. But you are releasing some serious $$ in prizes to the winners. I think it should be legitimized. If nothing is done about it, you’re opening the door to people cheating, and inviting them to say their fish are bigger than they really are. It’s not fair for someone to do that, and as you know, the competition is fierce in the last couple weeks. It seems like the top spots are always putting up fish that are 1” or 2” bigger, at the last stretch of the tournament. You guys need to come up with something! Thank you! (2 years ago) but I completely agree and could not have said it better Daniel! I think this is a awesome idea! Nothing like holding up a huge bass and properly releasing it back, I just want the picture! Much respect to The OTW crew for their effort to preserve the majestic Striped Bass for future generations!!! Thank you for the changes. I will enter this years Striper cup. Great idea!! I once caught a monster off Griswold PT in Old Lyme CT. Actually pulled my 14ft Jon boat all over the place before i landed it. So majestic I had to release it!!!! Massive never weighed it or measured it. ITS ABOUT TIME ! GOOD MOVE. In my 12 years fishing your tournament I have never weighed in a fish, mainly because it was too inconvenient to keep a fish in my kayak and find a weigh station. I like this new rule, take a picture and let the really big fish go , keep a few mid 30 inch fish a year for the dinner table. Thanks for the change to the tourney re. weigh-ins. For the anglers of the future, like my grandsons and granddaughters, I thank you. Will you be doing the kayak competition again for the hobie worlds?? I personally agree with this because our fishery’s are declining and the large fish are the top breeders. On the other hand all catch should require a picture with a tape measure and a Bogga grip scale or such and a pic of the release with the angler for a chance of a prize. Well done folks! A great event, just got even better, this makes sense in every way. It isn’t surprising, OTW is ever evolving , innovating, and improving the fishing experience for fishing enthusiast in the Northeast! I like this idea. I always felt guilty about killing a huge fish just for the tournament. But, it does bring up other concerns. First, I think it really opens the door for cheaters. And if honesty competitors start feeling like others are cheating, they will stop doing the tournament. I know I would. Some comments mentioned this same thing. Others commented about weighing fish with a Boga grip. Two issues with the driving option. People can lie about the weight. They can alter the fish weight. And mostly, not every person is going to spend $250 on a Boga grip. Not to mention, there is some evidence that even vertically weighing a fish causes damage to it. I assume it will become a length, or maybe, length and girth measurement. But birth can be altered too easily. Length only creates a problem also. Two people could easily have a 48 1/4″ long fish. Or fudge a fraction or more, than can’t be determined in a photo. Maybe they do a person’s top 5 fish lengths? Also, I believe they will have to give every participant a dated, and color specific, tape measure, t-top keep people from using photos from earlier years. I dont know how they plan on doing it. I will be very curious of what their plan is? I totally see, and understand why they are taking this step. I just hope it does not become the demise of the tournament. Way to set the bar. I’m sure there will be a few hiccups with anything new. However, don’t let it be a setback. Maybe there is a small entry fee for an OTW retractable tape measurer? Points off for poor handing of fish, ie lying in sand or baking on the deck of a boat. You guys do a great job and you’ll make sure that anything that is an obstacle becomes a strength. Kudos on being a first mover. Great news. May I suggest teaming up with a group like the American Littoral society and including a bag of tags when you sign up for all the released fish. Two of my great-grandchildren caught their first fish last summer. One of my clients’ sons caught his first bluefish. Any intelligent measures we can take to secure recreational fisheries for future generations has my support. Thank you for taking this step! The Striper Cup takes place from Maine to New Jersey. I applaud the change and it’s important for every part of this fishery to do its part in protecting this special resource. I am going to sign up! Question: do the new rules require a statement from us that we released the fish? If I decide to keep a large fish and send in the measurements, am I in violation of the rules and thus ineligible to enter that fish? In addition, I have released several large fish after photographing and measuring them (and tagging some) only to be unable to revive them. Would these also be ineligible to enter? Yes I will catch and release It will feel good to make a difference in do my part. !!! If entering OTW striper cup am I limited to only fishing one division?? Recently purchased a new yak but also love throwing plugs in the surf… or can I catch fish and submit pictures regardless of method caught?? Thanks for your time.